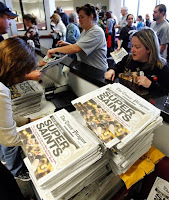 In New Orleans today, people are STILL lining up for the commemorative Saints special section. Now that I think of it, we hadn’t made any plans for a Jets section, although we did do a World Series extra. Anyone else out there in Jets territory make, and then scrap, plans for a “Going to the Super Bowl” extra?